In the last ChessMasters event, we proved that you, fellow Steemians can not only vote, but also play games to win STEEM! We also learned that we have quite a few strong chess players in our midst! Also, the winners will soon receive their rewards according to the announcement post. You can check other details of the tournament and watch played games here. The next tournament(s) will be this weekend. 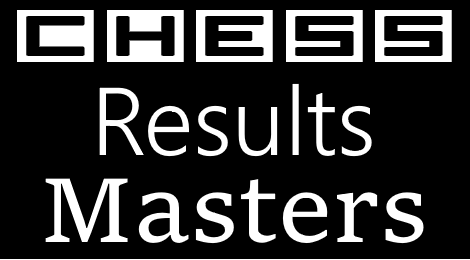 The details will be published in the middle of the week, so follow and vote @chessmasters account! Meanwhile, all of the Steemit chess players who wish to participate in forecoming tournaments have some time to prepare! 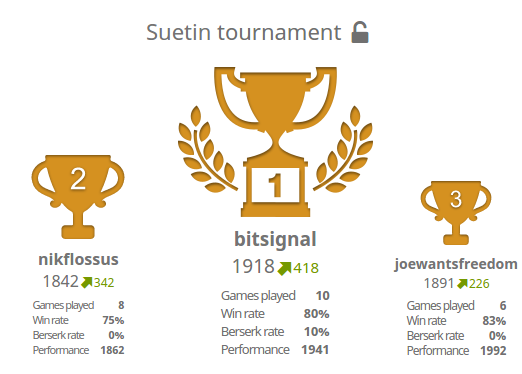 The winner of the last tournament used the Arena Berserk option to get more points and play more games than other participants. Though it is not easy to play with half of their clock time, it may help you get points if you feel your opponent plays weaker then you. you will know your strength and this info will be usefull when future tournaments have rating limitation. 3. Check your statistics on Lichess.org that your account generates. You can find your statistics by typing https://en.lichess.org/@/[your lichess nickname] in a window. I.E, my nickname is stranger27 and my page is https://en.lichess.org/@/stranger27. 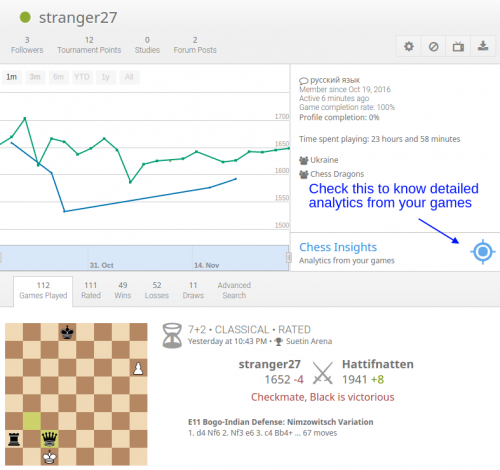 Pay attention to the Chess Insights section - it contains some very interesting data from your chess matches. 4. Try lichess training section. It gives you great suggestions to increase your chess skills. It will be interesting to know your thoughts about our initiative, feel free to share your comments and any suggestions you may have. I tried the berserk option once to test if I can handle the one sided time pressure. In this tournament it did not change the end results but I have seen tournaments where results changed in both ways because of using the berserk option. In general it is a high risk to use the berserk option if you play a fast player. The simpler the better. At the moment there is no opportunity to disable Arena Berserk when tournament is created. Plans for future are to start tournament with rating limitation so all players can have chances to win, and it will be difficult to play berserk with strong players. I guess middle players and beginners will rarely use it as time control 7+2 is rather short. It was fun, start time was bit late for me but I played few games before I had to go.